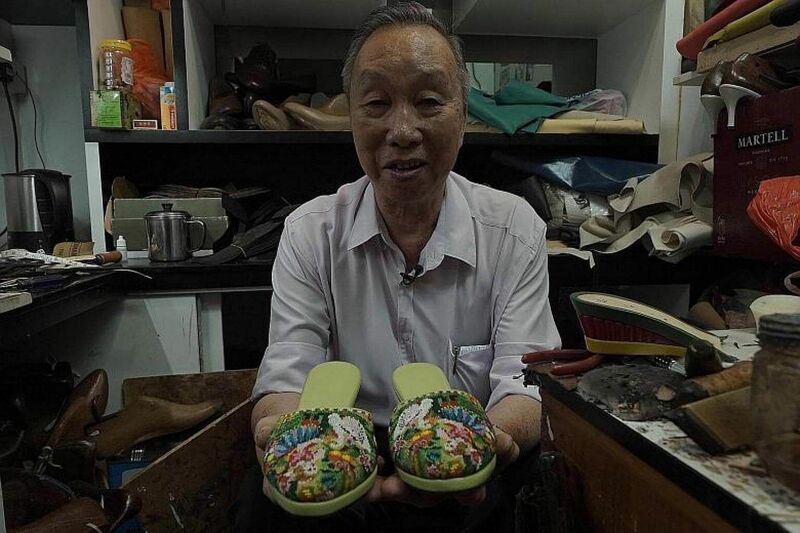 Mr Soong Kwek Choong, 78, hand-makes beautiful footwear. In May this year, he was diagnosed with glaucoma and cataracts in both eyes. His vision was renewed after he went for surgery. In a small, cramped store at the basement of Golden Mile Tower is a man who has dedicated more than half of his life to making shoes. Sitting in a space that has barely enough room for anyone to move, Mr Soong Kwek Choong, 78, makes by hand beautiful footwear. He specialises in custom-made shoes, from simple flats to lace-up boots, high heels and even Peranakan beaded slippers. A pair of kasut manek or Peranakan beaded shoes costs more than $1,000. His other designs, including high heels and even speciality shoes for people with disabilities, start from $350. "Everything in this shop is made by hand," said Mr Soong, as he put the finishing touches to a pair of cream-coloured leather sandals. He learnt the art of shoe-making from his father. "I started when I was 13 years old," he said. "My mother told me that if I don't have a skill, I will have trouble making a living." Despite mastering shoe-making, he became worried about his livelihood after he noticed in May this year that his vision was blurred. "I could not differentiate between black and blue threads. I had to look extra hard," he said. He also wondered if it was an other-worldly phenomenon. "When I was sewing, I felt as if there was someone walking next to me. I thought I was possessed," said Mr Soong. "But I didn't believe in all that, so I went to the doctor to get my eyes checked," he said. He was diagnosed with glaucoma and cataracts in both eyes. Glaucoma is a condition that damages the eye's optic nerve, causing blurred and tunnel vision. A cataract is the clouding of the lens in the eye, which affects vision. A Ministry of Health spokesman said that last year, there were about 35,000 cataract operations in Singapore, up from 33,000 in 2015, and 32,000 in 2014. More than 60 per cent of those who went for cataract operations are seniors above the age of 65 years. A cataract awareness survey conducted by Johnson & Johnson Vision in August found that only 11 per cent of the 600 people interviewed - aged 55 and above, living in Hong Kong and Singapore - were aware that vision that is lost due to cataract can be regained after surgery. Dr Ronald Yeoh, senior consultant ophthalmic surgeon at a clinic in Camden Medical Centre, said most of his cataract patients go to him complaining about a progressive gradual blurring of vision, which could not be corrected by glasses. When Mr Soong's doctor told him that glaucoma was hereditary, he was concerned. "I thought about my father. He became blind in his 70s, so I thought I should do something about it," he said. In September, Mr Soong underwent cataract surgery on his left eye at the Singapore National Eye Centre. "After the surgery on my left eye, I can see clearly. So now, I've decided to go for the operation for my right eye," he said. With his renewed vision, the widower plans to continue with his craft. Mr Soong's wife died about two years ago. He has three sons and two daughters, as well as six grandchildren and three great-grandchildren. Mr Soong revealed that he had honed his craft when he was 15 at a shop in Johor Baru that made shoes for the royal family and high society. But, not content with making regular shoes, he then travelled to Melaka to learn his speciality - the making of Peranakan beaded shoes. At 25, he returned to Singapore to start his business. His first shop was in Amoy Street. He later moved to Geylang, before settling in at Golden Mile Tower. "In this line of work, we depend on the customers. When there is demand, business is good. When there are no customers, I go hungry," he said. "I'm not planning to retire. I will work until I can no longer work any more."